As beauty editors, we get bombarded with a ton of new products every day. (We know—tough life.) Reviewed is a series where we report on some of the best products we've tried. Whether it's a drugstore lipstick that lasted all day or a hand cream that saved us this winter, you'll find all our favorites in this column. Enjoy! After a winter filled with biting, dry wind gusts and a few too many blizzards, my lips have seen better days. I keep them consistently hydrated (my favorite balms are Dior Crème de Rose Smoothing Plumping Lip Balm, $30; La Prairie Anti-Aging Eye and Lip Perfection à Porter, $180; and Glossier Balm Dotcom in Rose, $12), but still, my lips were left flaky and cracked from the weather. By a divine stroke of luck, I had reached my breaking point—or, flaking point, in this case—on the same day Stacked Skincare's newest launch came across my desk. 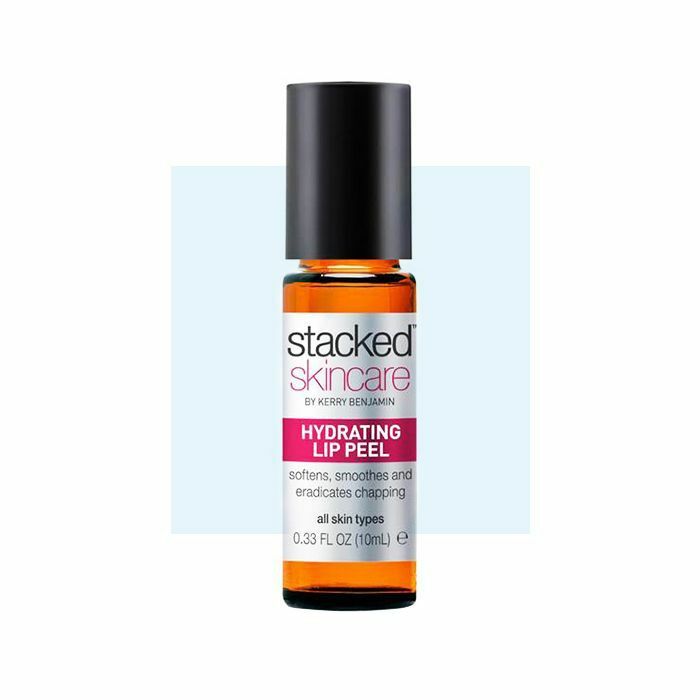 I've been a fan of the brand for a long time (everyone at Byrdie HQ swears by its derma-roller, serums, and body peel), so I was immediately intrigued by the newest launch: Hydrating Lip Peel ($26). The claim? It will "transform your lips from dry and cracked to soft and silky." The instructions suggest you roll the formula onto your lips, allow it to dry, and then apply your favorite lip product. As it dries, the serum works to dissolve rough, dry skin with actives including glycolic acid (to exfoliate), lactic acid (to hydrate and soften), apple fruit extract (for nourishing antioxidants), and green tea extract (to prevent skin aging). Afterward, my lips felt a bit tight, and I was skeptical. Then, as I smoothed lip balm on top, I felt the resurfacing happen in real time. As I rubbed my finger over my lips, the roughness faded away and in its place was silky-soft skin. I couldn't believe it. As instructed, I continued to apply the blend one to two times per day and even used it as a base for my micro-roller to plump and hydrate even more significantly. I looked in the mirror and felt like Bella Hadid—my lips were moisturized, pillowy, and visibly fuller. Additionally, the ingredients included are natural acne-fighters (score), so you can use it as a spot treatment in a pinch. Let's call this one a win-win-win. What are your favorite hydrating lip products? Let us know in the comments below, and check out our other honest product reviews.